I’ve actually missed a pair, as I made John a pair of Jaywalkers in Fleece Artist yarn (“mermaid” colour), but I neglected to photograph them as soon as they were finished and he generally wears them as soon as they’re clean. I haven’t been able to get my hands on them while they’re in a state fit to photograph. I just finished these (below) this morning and finally now have a chance to sit down, photograph them (quickly) and write. 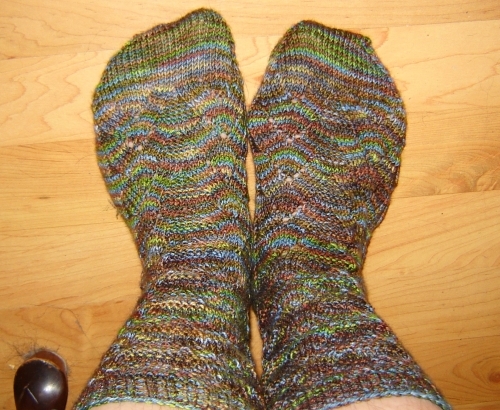 These were knit in Fleece Artist merino sock, colourway “woodland”. Pattern (“Monkey“) by Cookie A found in Knitty (winter 2006). 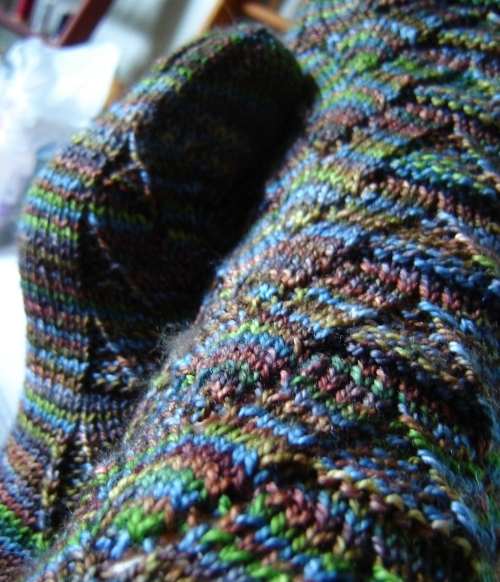 Look horrible while being knit – all knobbly and bumpy. Once on the foot, though, they stretch out nicely. Good for wide feet. Quite roomy. Those with narrow feet might need to make adjustments.